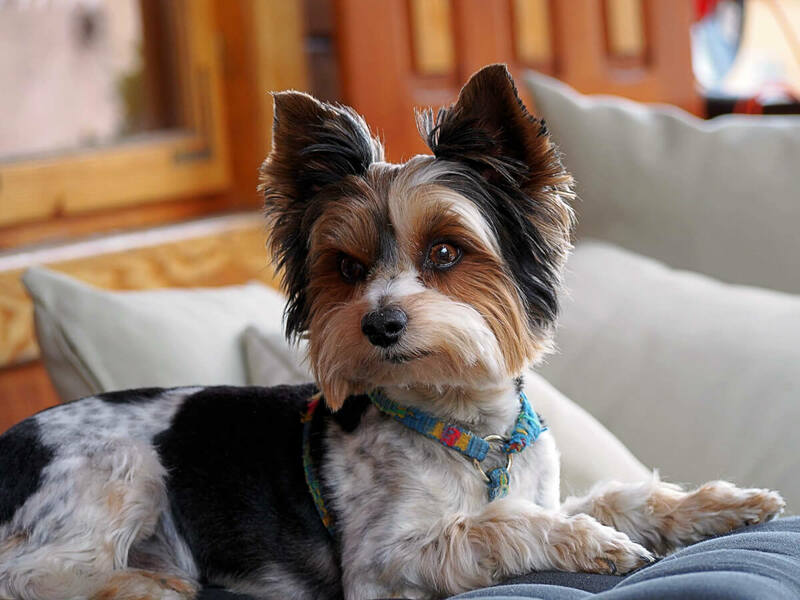 The Biewer Terrier is much more than a tri colored Yorkie; she is a companion for all! She is very much like an adventurous child with her go-anywhere do-anything personality and love of affection. Biewers won't take up much space and don't require much exercise, however, keeping their luxuriously long and silky coats in good shape is another story. Good with careful children and friendly with other pets (if socialized properly) they make excellent additions to many households. The only mismatch for this breed is someone who is gone the majority of the time and can't take a pet along. The lighthearted personality of this toy breed (4-8 pounds) is surpassed only by their luxurious appearance. These are clearly companion dogs that thrive on your attention and affection. 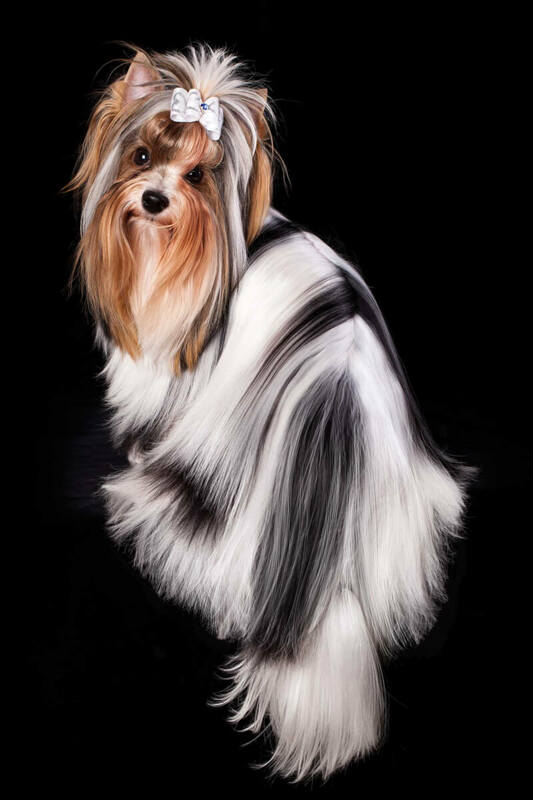 In contrast to the Yorkshire Terrier, the Biewer has a tri colored coat that contains a substantial amount of white. 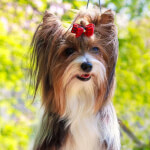 The long, silky hair symmetrically falls down both sides of the dog and the plumed tail in carried high over the back. The additional Biewer Yorkie information in this article can help you decide whether this is the right breed for you. 1. Intelligence- Biewer Terriers are pretty smart and shouldn't be too hard to train for a first time owner. That being said, they are also a bit mischievous so don't expect too much from them. Socialize them early for the best results with other pets, which they usually get along with fine. Although not yappy dogs, they may bark at the approach of a strangers-- if they are bored this can get out of hand. 2. Kids, Strangers, Pets- If you have children that have been taught how to carefully handle a fragile pet, than this breed is an excellent addition to your family because they LOVE attention; rough play can easily injure them. After the initial introduction members of this breed will be friendly around strangers but it's not unheard of for them to be a bit shy. If well socialized, they get along just fine with other pets and having another dog may lessen anxiety when you aren't home. 3. Exercise- These tiny dogs will be active indoors. Apart from a few short walks, they don't require any stringent exercise routine. A few toys will help keep them occupied while alone. Biewer Terrier history begins in 1984, although Gertrude Biewer and her husband had been breeding Yorkies for around 20 years. It was in this particular year that the piebald puppy Schneeflocken von Friedheck was born with a silky coat of blue, white and gold and this began a fervent undertaking to produce more piebald Yorkies with greater amounts of white. After several years of breeding, Mrs. Biewer was able to register this as a new breed with the Allgemeiner Club der Hundefreunde Deutschland (of Germany) as the "Yorkshire a la Pom Pon" in 1989. Unfortunately, shortly thereafter due to her husbands illness, Mrs. Biewer discontinued her program. During the early 2000's a few select breeders took on the task of perfecting the breed and forming the Biewer Terrier Club of America. With the help of Mrs. Biewer herself they were able to establish this is ,indeed, a new breed, and more than just a tri-colored Yorkshire. The name was changed to "Biewer Terrier" and they have been a member of the AKC since 2014. Brazilian, Bahamian and South African Kennel Clubs are among other new organizations to recognize this breed. 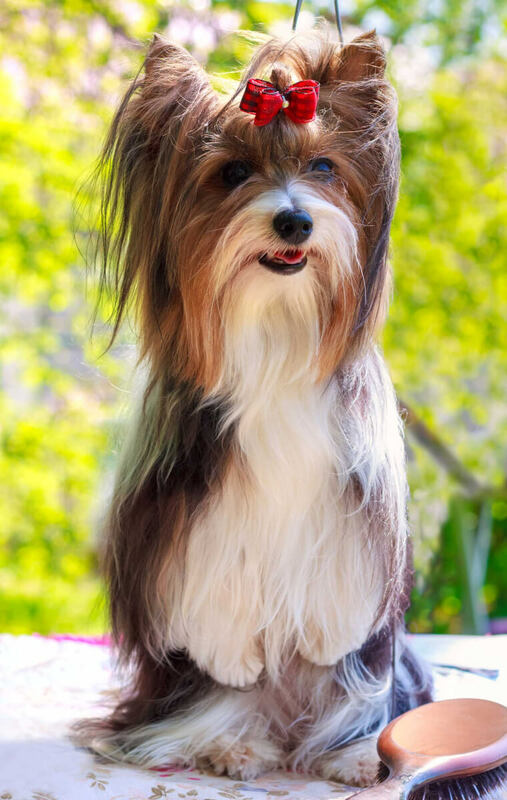 When describing the Biewer Terrier long, luxurious coat, the AKC gives the color specific to the area of the body. The chest, stomach, legs and tail tip should be white. The hair on the back can be blue or black and white. On the head can, there can be any combination of: blue, black, white, gold or tan (as long as the coloring is symmetrical). 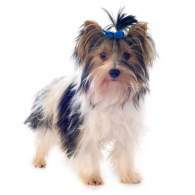 Note, Gold Dust Yorkies (tan and white) are not the same as parti Biewer Terriers. 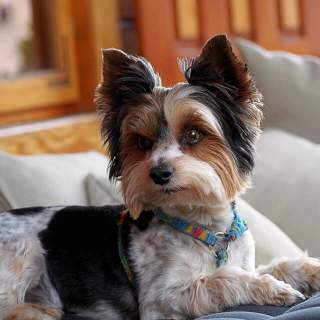 Biewer Terriers (also referred to as Biewer Yorkies) are already little dogs and are considered a toy breed. They are bred in a standard size with no height requirement but a weight range of 4-8 pounds ; they probably won't exceed 8-9 inches at shoulder height; they . Be careful with breeders offering "teacup" Biewers, breeding down these already tiny dogs likely results is more health issues for the puppies. The Biewer Terrier temperament is like that of a small child. They enjoy being doted on and will want to go everywhere that you go-- with a happy, fearless attitude! This bravery allows them to see themselves as "big dogs" but in reality they are fragile, so try not to allow rough play, jumping off furniture, etc. Members of this breed are smart and loyal to their owners and families. They are usually good with older kids that have been taught how to handle a fragile pet. 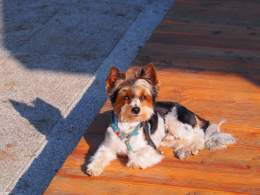 Biewer Yorkshire Terriers also get along well with other pets, if well socialized. Although they make lighthearted companions for all ages, this is NOT the breed to be left alone frequently. If you travel, they will want to accompany you. While you're at work make sure they have plenty of toys and, preferably, another doggy friend. Failure to spend enough time with them may result in a yappy, destructive handful. Below are pictures and images of the Biewer Terrier. Choose a reputable breeder that can offer proof of health for the parents of the litter (at the very least) and don't skip your routine vet visits-- these are key in early detection or prevention of health problems.